Interested in a place that’s beautiful, relaxed, casual, welcoming, friendly, fun, and interesting? We are… these are the types of places we search for when we travel! We often find this vibe on Islands… would Manitoulin Island capture our hearts? Yes! As we left Parry Sound and traveled north west along the Georgian Bay, we eagerly anticipated some island time. We were also excited to meet-up with my parents who had driven to Tobermory and were taking the ferry over to Manitoulin Island to join us for the next couple destinations on the trip. Manitoulin Island is in the northern part of Lake Huron and is the largest freshwater lake island in the world. There are two ways to access Manitoulin Island by car. The Chi-Cheemaun ferry runs multiple times a day from Tobermory when the lake is not frozen. The Chi-Cheemaun takes about 1.5 hours and arrives at the south east corner of the island. There is a bridge at Little Current, in the north central area of the island, that joins the mainland to the island. The bridge is a one-way swing bridge and is closed to car traffic 15 minutes each hour to allow boat traffic to pass. Once on Manitoulin island we headed to Providence Bay on the south central shore of the Island, which is about an hour from Little Current. As we drove south through the center of the island we noted lots of agriculture… fields of crops, cows, and barns. The island’s several small towns are dispersed throughout the island and there is a lot of open green space in between. 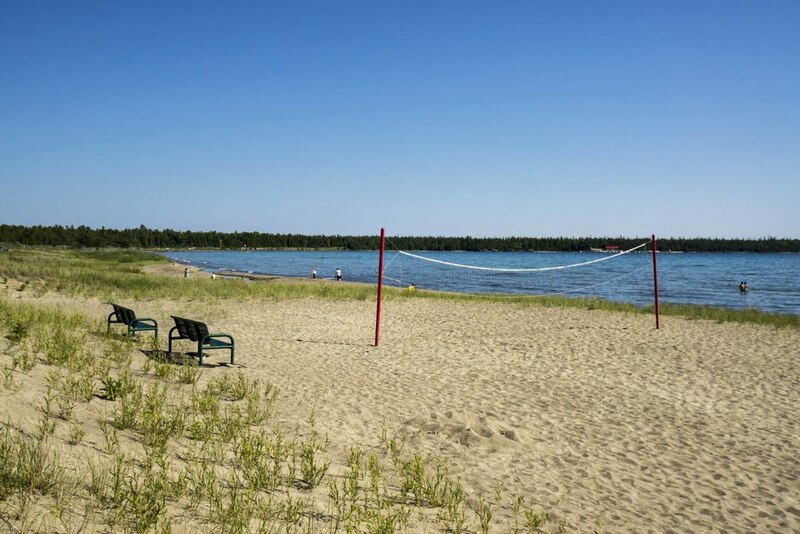 We chose to stay in Providence Bay because it’s where the largest sand beach on the island is located. We stayed at Providence Bay Tent and Trailer Park, which is located directly across the street from the beach, and had a great experience! We have had sites with more atmosphere, but the location is amazing, the staff is super friendly and helpful, the washrooms are clean and supply plenty of hot water, and the campground store is well stocked. My parents stayed at Cedarwood Lodge in Providence Bay, which is located on Cranston Street, just a couple streets over from the beach. Cedarwood Lodge is a small lodge with three spaces. My parents’ space was like a little apartment – very spacious with a little kitchen, living room, and a bedroom. The room came with breakfast and the fantastic hospitality of Ken and Jean Pearce, the owners of Cedarwood Lodge. We spent 4 nights and 3 full days on Manitoulin Island, which gave us a chance to dig in a bit. What follows are some general themes from our trip and then specifics about the areas we explored. The people are awesome! Every single local went out of their way to be helpful and welcoming… no exceptions… from Ruth, who I met at the laundromat, to Ken and Jean Pearce at Cedarwood Lodge, to the nice couple who stopped to help my parents with a flat tire… all great people! Manitoulin Island is also the home to a large First Nations (indigenous people of the Americas) population, and there are a number of opportunities to learn more about the First Nations culture, traditions, art, etc. There is a lot to do on Manitoulin Island, mostly focused on outdoor activities. We hiked, biked, fished, swam, and chased the sunset. There aren’t a lot of shopping and dining options… I’ll note the ones we found below. For us, the laidback speed was great, but it might not be enough for some. Manitoulin Island is very large and spread out... we didn’t stress ourselves out trying to see and do everything, so there are a few things we missed… Little Current, the Cup and Saucer hiking trail, and a couple highly rated restaurants (Garden’s Gate and The School House). The lodging options are mostly campgrounds, cottage rentals, and bed and breakfasts. There are a few motels, however it seems that the other options offer closer proximity to the water and other natural beauty. When we arrived in Providence Bay our first order of business was to visit the beach. We walked across the street from the campground and found about a mile of beautiful sandy beach. For those who don’t like sand, there’s a boardwalk that’s about a half mile long and leads to an amazing playground. Daniel spent a lot of time at the playground during our trip and you can check his blog for the important details! There’s also a snack and ice cream shack along the way! 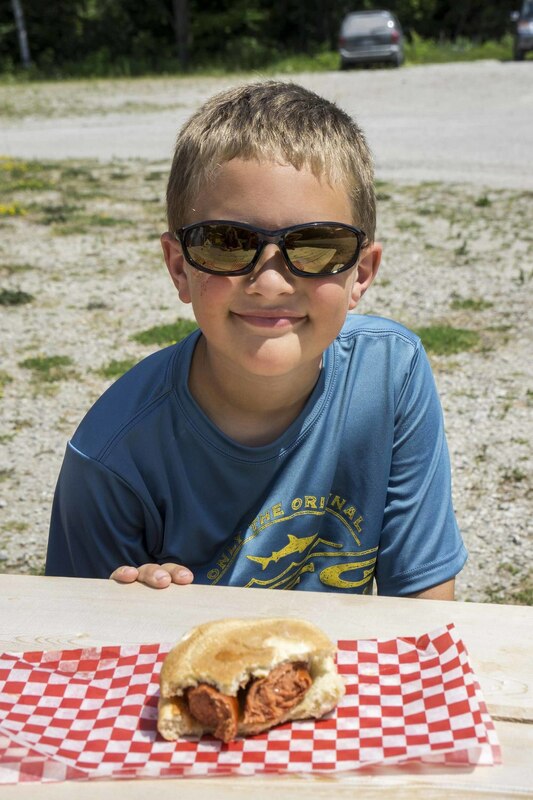 Lake Huron Fish and Chips and The School House are the two dining options in town. My parents and Daniel went Lake Huron Fish and Chips for dinner and reported back that the fish and chips are excellent. They also serve burgers. Mutchmor Galleries is on the corner of HWY 551 in town and is worth a visit. It’s a large space and has lots of local art and goods from various shops on the island. The Peace Café is located in Mutchmor Galleries and offers coffee and baked goods. 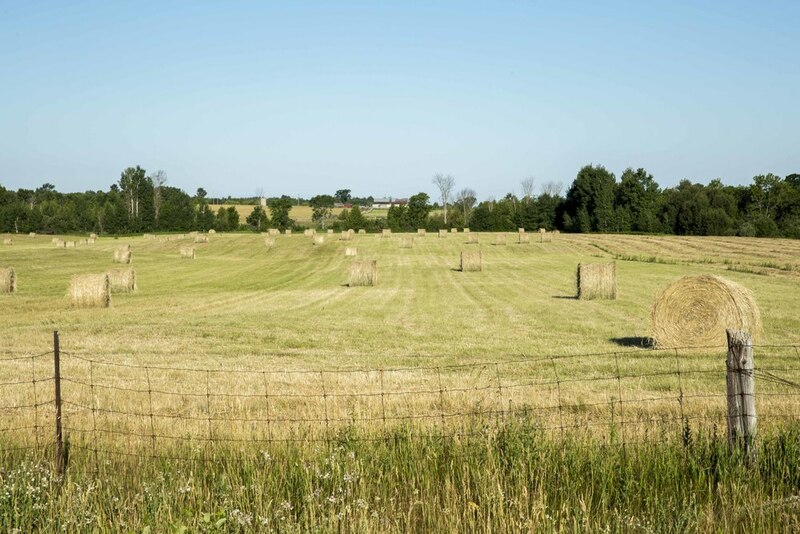 Manitoulin Island has a large farming community and Manitoulin Meats is a cooperative of local farmers committed to the local food movement. We purchased steaks to grill from the Manitoulin Meats shop on the outskirts of Providence bay and loved them! An item to note about Providence Bay… currently there is no cell service for a 5 km area. We were told that they are building a tower in the fall, so there might be cell service by next summer. We were able to get service everywhere else on the island. Mindemoya is about 15 minutes away from Providence Bay and is the largest town, other than Little Current, on the island. Mindemoya has 2 laundromats, a gas stations, a grocery store, a pharmacy, a LCBO (beer, wine, and liquor), a convenience store that’s open until 10, a few dining options, and a couple auto shops (in case you get a flat tire!). The night we arrived on Manitoulin Island we drove to Mindemoya for dinner at The Roosterant. The Roosterant has OK reviews and we weren’t sure what to expect… we had a really good meal… the best restaurant meal we had on the island! The Roosterant offers a variety of salads, sandwiches and wraps, and pizza. Todd had a Greek salad with chicken, I had the “summer” salad with shrimp, and my parents and Daniel had pizza. The salads were excellent and the pizza was very good. My mom and I stopped at Mum’s Restaurant and Bakery for a quick salad while the guys were fishing. Mum’s doesn’t have a ton of atmosphere, but the salad ingredients were good quality, fresh, and crunchy. We didn’t get any baked goods, but noticed a shelf of very tasty looking treats! There’s a deli and convenience store in the middle of town that’s open until 10pm daily. This is a big deal because many things on the island close at 6 or 8! Also, one of the laundromats is open 24 hours (if you’re looking for it, it’s the one by the car wash). 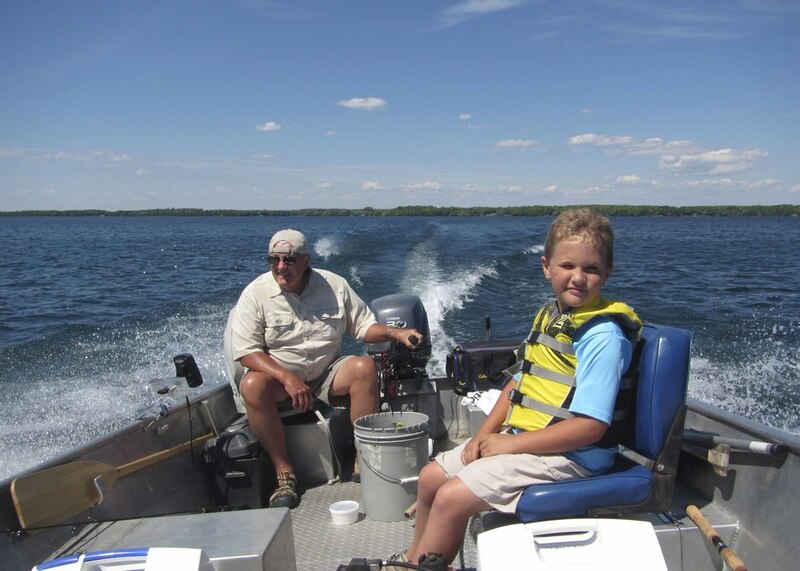 My Dad is an avid fisherman and one of Daniel’s favorite activities with his Papa is fishing. When Papa arrived in Canada the first thing Daniel asked was “when are we going fishing?!”. 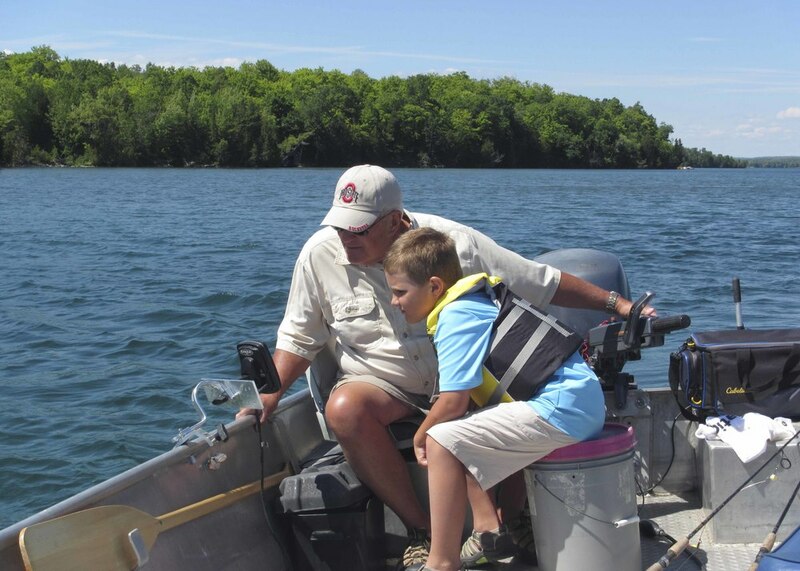 In addition to fishing on Lake Huron, Manitoulin Island has a number of large inland lakes, and various camps and marinas rent boats for the day. My Dad chose Timberlane Rustic Lodges on Lake Manitou for the outing. Timberlane Rustic Cabins and Marina rented my Dad, Daniel, and Todd a boat for half the day and they were off… the weather was perfect and the lake was like glass. Fishing report: as my Dad often says, the fishing was good but the catching was bad… no fish to bring home but a great afternoon on the lake! Kagawong is a little town with a pretty harbor, lots of candy, and Bridal Veil Falls. We arrived on the east side of town, passed the entrance to Bridal Veil Falls, went through town, and stopped at the harbor. After taking in the scenery we headed east to the Chocolate Shop, which sells locally made chocolate. Just up the road is a parking lot and the start of the boardwalk and trail to Bridal Veil Falls. We made a quick stop at a great little food truck, Hawg Eaters Slow Smoke BBQ, to get Daniel a hot dog for lunch. The hot dog was great! There are areas to park for Bridal Veil Falls closer to the falls, but we opted to take the short hike (about 15 minutes) from the beginning of the boardwalk. There are also a couple trails that are clearly marked on a map at the entrance. Bridal Veil Falls is beautiful spot to take a break before heading back. On our way in to town we noticed a shop across the street from the Bridal Falls Entrance that serves Farquhar’s Ice Cream, which is locally made and well known for being fantastic… we decided it was time for us to give it a try! My mom had orange pineapple, I had bear claw, and Daniel had chocolate brownie. It was great… every visitor to Manitoulin Island should have Farquhar’s Ice Cream at least once! We didn’t need any more treats, but couldn’t resist a stop at Boo-Bah-Lou Candy Corner. Boo-Bah-Lou is a really fun stop… lots of different candy… Pez, candy bars, toffees, gum, etc. It’s definitely worth a visit! Just outside of M’Chigeeng is Lillian’s, which sells First Nations goods and art. The store is packed… great for shopping and also enjoying the art of the First Nations people. There are two large rooms and be sure to go in both… the second has some amazing carved pieces that exemplify the First Nations people’s respect and love for animals and nature. Daniel learned about totem poles and was excited to purchase a small totem pole for himself. Gore Bay is about 40 minutes north west from Providence Bay and known for its harbor and Buoy’s restaurant. Todd and I had a date night and drove to Gore Bay to check it out and chase the sunset. Buoy’s is located at the harbor and has a large deck. The atmosphere is great… the harbor is beautiful and there was live music the night we were there. We were a little disappointed that they did not have fish, but totally understand that they only serve fish when it’s fresh caught. I had a salad and Todd had chicken. Both meals were fine. We noted that almost everyone ordered pizza, which looked really good. After dinner at Buoy’s at Gore Bay we hopped in the truck and headed west to find sunset shots… what an experience! We found big, beautiful farm fields full of deer. Being from Ohio, I thought I had seen deer before, but I’ve never seen anything like this… 30 deer in a field, and the next field, and the next field! We headed for Barrie Island and found a beautiful little inlet for sunset pictures. We explored Barrie Island a bit, which is all residential. It was really fun to explore and experience the natural beauty of the island! We loved Manitoulin Island and wrapped up our trip in a special way. Our last night we used the outdoor kitchen at Cedarwood Lodge (where my parents stayed) to grill our steaks and whitefish from Manitoulin Meats and enjoyed our meal in the garden of the lodge. Following dinner, we had drinks with Ken and Jean Pearce, the owners of Cedarwood Lodge and learned about their journey to Manitoulin Island, building the lodge, and what it’s like to live on the island. It was an absolute treat and we are thankful to Ken and jean for making the last evening of our stay on Manitoulin Island extra special!